SkillsUSA is a partnership of students, teachers, and industry working together to ensure America has a skilled workforce. SkillsUSA helps each student excel. 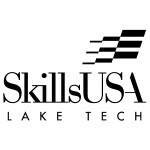 Students in several programs at Lake Tech participate in SkillsUSA and the competitive events that take place each spring. Individuals wishing to help sponsor a competitor may contact DeAnna Thomas at 352-589-2250, ext. 1813.